This girl has made live selling a career. Most buyers and viewers call her "Manay". She owns a shop in Manila and now owns a website and she has the most numbers of followers, viewers and buyers among FB live sellers I knew. She has created a Facebook group where she would do live auctions solely for resellers. Most of her items are sold out every time she is on live. I bought my first online purchase thru Facebook live selling from her. It was a Louis Vuitton Saumur 30 sling bag. The transaction was smooth until I noticed that I had given her the wrong zip code and the bag was dropped off the post office already. I panicked and sent her private message right away and guess what, she took care of it promptly. I got my bag on the mail and it was inside a Louis Vuitton dust bag, I remember there was no inclusion when I purchased it. That was really nice of her! There have been no items I purchased from her since then because it was becoming hard to compete with whole sellers/ resellers from Philippines and considering the time difference, it is really hard to catch her on live. 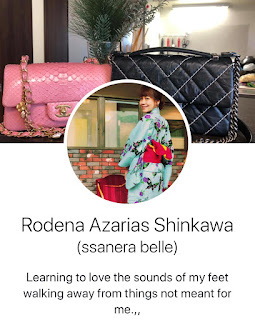 If you are interested in buying luxurious items from Japan for personal use or for reselling purposes, she is the person you want to do business with. You name it, she will find it for you. Aside from Facebook, she can be found on Instagram and I have not followed her yet because I am not an Instagram person, but if you ever search her name, I am sure you would find her. Beware of fake accounts though, many times her Facebook account had been copied and, hacked. This screen shot was taken from one of her videos on Facebook. 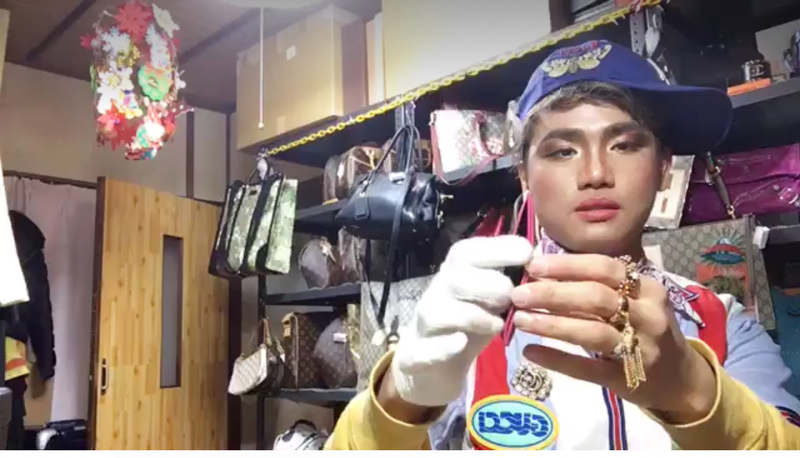 Another Facebook live seller that I like and I would recommend is Ms. Daisy Rallos from Choba, Japan. She is originally from Leyte, Philippines. She sells pre-loved high end brand of jewelries, bags/purses, wallets and other accessories. She priced her items very reasonably and I have bought a Spring themed Burberry umbrella which I have not used to this day and a Fendi scarf from her last year. The items came in as described and I love the "Blendy sticks" coffee she included in my package as freebies. Ms. Daisy has her fair share of viewers and patrons but she cannot give 100% time to her business because her husband and her daughter are her top priority. 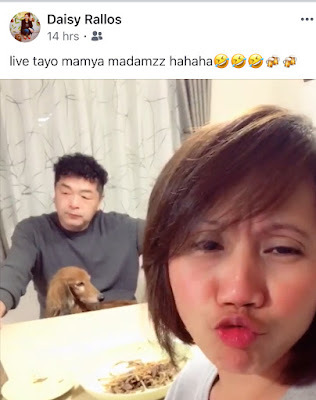 Whenever her husband comes home in the middle of her live selling, she would quit right there and then and bid her viewers goodbye at once and for that, she gained my respect. As a seller, she is honest, she makes sure she mentions every flaw she finds in the items she is selling. She is funny and she laughs at her heart's content whenever something amuses her while doing live selling. Because we are also friends on Facebook, I have always loved her random funny videos and silly photos she posted. She has a pleasant personality. She recognizes her mistake and apologizes for it. However, like any other online sellers or any other human beings so to speak, she can be mean and brutal too so to all the scammers, bogus buyers and joy miners out there, consider this a warning! Hehehe! This is a screen shot taken from one of his videos on Facebook. It was Marvin Joy Buico and his mom Sheila Marie Ikema from Osaka, Japan who kind of introduced me to pre-loved items from Japan. I somehow bumped into them on Facebook and initially enjoyed watching them together. I got really hooked when I learned that they are originally came from Kanaway, Surigao del Norte, a few hours from my birthplace Bangonay, Jabonga, Agusan del Norte. Marvin and his mom do not really look like mother and son. They look like they are siblings. They are really good entertainers because they can sing and dance. Their favorite background song is Material Girl by Madonna and eventually, Marvin indeed became a "Material Girl" and he doesn't deny it. We are friends on Facebook and I had seen the evolution of him in the material world. 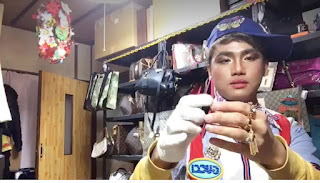 At some point, I wanted to buy this fabulous Louis Vuitton bag from him but he always has too many buyers with high speed internet connection compared to mine so there was no way I could compete. I did not try again because I have had found several live sellers along the way. But whenever he is live during my free time, I still would watch him to get entertained. If you wanted to watch his live video to see his high end items, just find him on Facebook. The last time I know he had reached 5K friends already and cannot add anymore, or was it his mom, I am a little confuse now. But hey, thank you for reading my post, I appreciate it a lot.